Chop the apples without peeling or coring them and put in a pan with the water and berries. Simmer for about 1 hour until very soft. Cool. 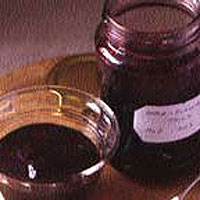 Tip into a jelly bag or large seive lined with muslin, hung over a large bowl. Leave to drip for 12 hours. Discard the pulp and measure the juice in the bowl. Pour into a preserving pan and add 100g sugar per 100ml juice. Place over a medium heat. Stir till the sugar dissolves. Bring to a boil. Boil for 10 minutes, then test for setting point. Drop a little jam on to a cold saucer. Leave for a minute then push with your finger. If it wrinkles, it's ready; if not, boil for 5 minutes and repeat. Pour into sterilised jars, cover with waxed discs and seal. Keep for up to a year.